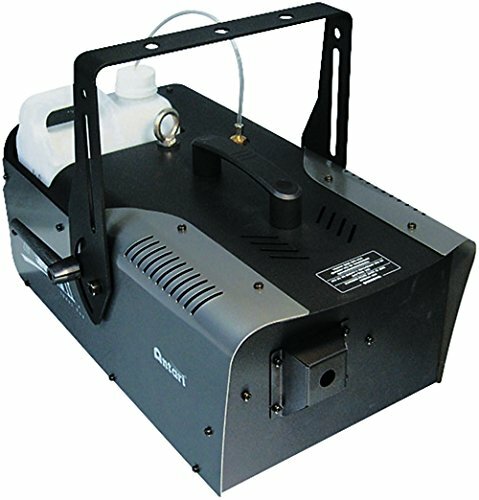 Z-1200 II 1200 Watt Pro Fog Machine. "The Elation Z-1200II dominates the entry level fog machine market with its high performance output and high tech features. The Z-1200II is equipped with the ECO thermal control system and the patented UNICORE heater technology. The systems electronic thermostat can detect even a very slight temperature drop and will automatically re-heat the machine, which results in a thinner, consistent stream of smoke, as opposed to ""black bursts."" In addition, it is armed with on-board DMX-512 to work with club lighting directors, installers, designers, and DJs who need more fog control. The machines heater core can easily be taken out from the heater block for a quick and easy cleaning to prevent clogging and insure trouble-free performance. The heater element is like a powerful jet stream that can deliver large bursts of fog. The Z-1200II comes with a high quality pump and electronic low-fluid detector also known as Thermal Cut-Off (TCO) which automatically shuts off the pump when the fluid level is low, protecting the machine from damage. " "1200-Watt Heater ECO advanced thermal control system Unicore technology On board DMX Output: 18,000 cu.ft/min Tank Capacity: 2.5 Liter Fluid Consumption Rate: 44 Min. / Liter Remote Included: Z-8 (Timer Remote) Optional Remotes: Z-9 (Wireless Remote) Includes hanging bracket Weight: 24 lbs. Dimensions: 18"" x 9.75"" x 7"""